The ingredient today is komezu, a humble staple in the Japanese pantry. Rice vinegar, or komezu, appears everywhere in Japanese cuisine – marinades, pickles, stews – and for those not overly familiar with Japanese cooking, it is used in sushi to give the rice its distinct ‘sushi-rice’ flavour. Each area in the world has their own distinct vinegar, developed and refined based on local climates, vegetation, and customs. In Japan, where the major food crop is rice, komezu became the dominant variety just as, in France, wine vinegar developed due to the popularity of grapes. One curious thing about vinegar is that despite being a ubiquitous seasoning, it’s rare to see it cross borders: one would be hard-pressed to find Japanese rice vinegar in cuisines outside of Japan, much less in French cooking. Chef Guillaume chose to use oysters. 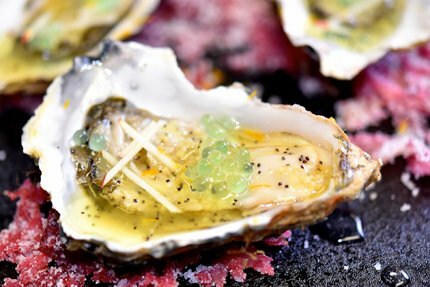 Acid is usually paired with the meaty bivalve, and it is often the star alongside luxurious white wines. 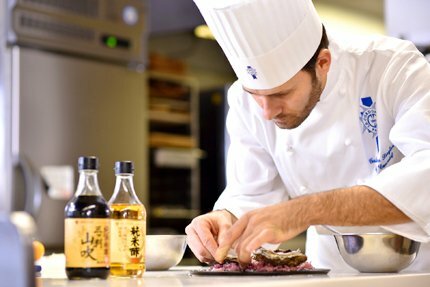 This time, Chef Guillaume will take a similar approach to dressing the oysters, but using the modest komezu. Made from sake lees (the fermented components in sake production), kasuzu is one of the two major types of rice vinegar. “Kasuzu has a richness that ties all the flavours of a dish together. 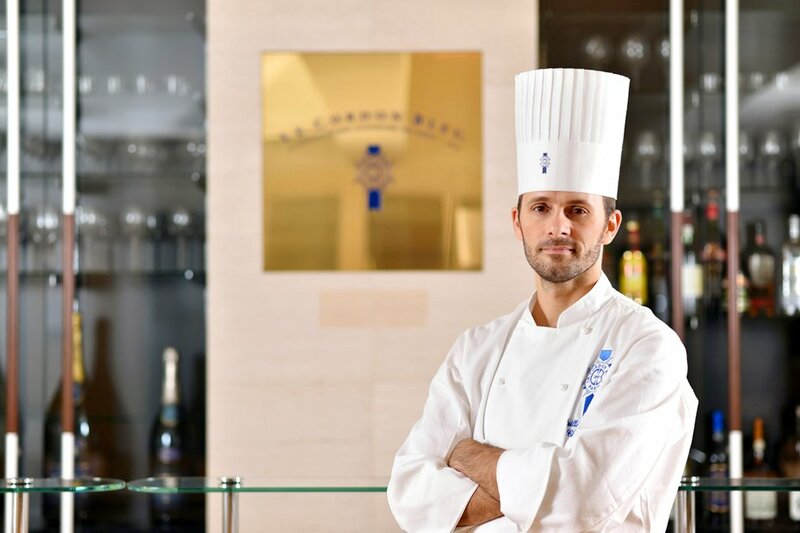 Adding it at the end helps bring that richness out,” explains Chef Guillaume. Beads of apple juice, komezu, and agar-agar, coloured with green apple peel. Chef Guillaume’s plate is an almost whimsical play of colour and texture. The oysters lay nestled on a bed of purple tosaka (a type of seaweed), it’s natural salt still clinging like white crystal ornaments. Tiny julienne of apple and exquisite agar-agar beads of apple juice and komezu are sprinkled over top along with curls of orange mikan (Japanese mandarin) zest. It resembles more a piece of art than a dish, but the oysters also taste as fun as they look. The surprise is in the sheer variety of texture and flavour in every bite: freshness of mikan, crunch and sweetness of apple, acidity from the vinegar, then the creamy brine of the oyster. The agar-agar beads pop to release accents of sweet and sour apple and vinegar. All these colourful tastes and textures joined together by komezu will make anyone smile.